Footage shows Bowe Bergdahl escorted by armed Taliban guards, before being whisked away in US helicopter. 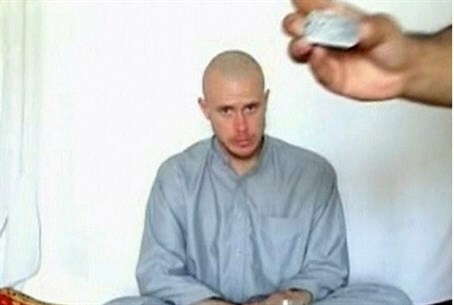 The Afghan Taliban have released video footage showing captive US Army Sergeant Bowe Bergdahl being handed over by armed fighters carrying a white flag to American soldiers. The deal, which took place on Saturday, saw the captive American soldier released after being held for nearly five years by the Afghan Taliban. In return, the US released five senior Taliban leaders, in a move which has received fierce criticism in some corners, and hailed by the Taliban as a "victory". In the footage, soldiers can be seen briefly checking Bergdahl for explosives before whisking him away in a military helicopter.